A variety of graphs and charts show your proficiency over time, view results for each finger, row, key, or hand separately. Over 100 Professional Lessons and Tests Improve Speed and Accuracy Quickly. Progress reports quickly identify your strengths and weaknesses. 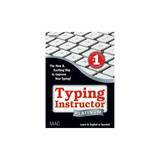 Quality Lessons and Tests allow you to learn quickly for faster touch typing and improved accuracy.